Every year, seven million shoppers visit Knalleland. The location now boasts everything from malls, big-box stores and specialist retailers to cafés, restaurants and grocery stores. Shop for the latest fashions, electronics, home furnishings, tools and toys in almost 100 stores carrying many thousands of items. 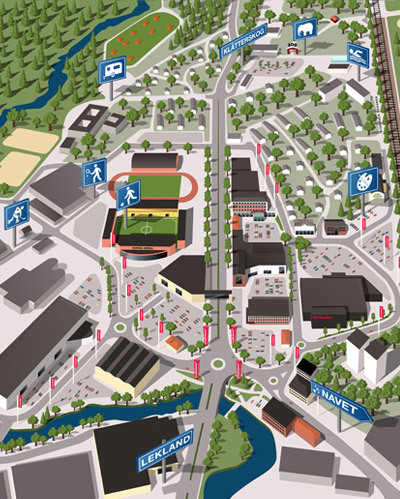 Other attractions in the immediate vicinity include Borås Zoo, Saltemads Camping, Borås Swimming Arena and several sports venues. What’s more, every year we host loads of events featuring performers, writers and sports personalities from across Sweden. Knalleland is shopping with a difference. At Knalleland, it’s all too easy to spend the whole day. We offer activities to suit the whole family, with everything from a zoo and playground complex to art exhibitions and football. At one of Sweden’s largest urban camping sites, you can rent canoes and pedal boats, play miniature golf or go fishing in the River Viskan, which flows through the site. The zoo’s savannah is home to elephants, cheetahs, monkeys, lions and rhinoceroses. A safari in Borås is almost as good as in Africa – but a lot closer. Visitors to the arena can enjoy swimming both indoors and outdoors. The complex boasts a swimming arena and open-air swimming facility including a 50-metre pool, diving board, water chute and children’s pool. A must for lovers of photographic, graphic and textile art. The collection includes works by internationally renowned artists such as Warhol, Dine and Hockney. Set your pulse racing with some ball games. This sports centre boasts eight tennis and four badminton courts, plus 18 gravel boule courts. In addition to an ice rink and curling sheets, the arena also houses foyers, as well as a cafeteria and conference room. The ice rinks are open to the public during the winter season (November to February). At the Navet Science Center you can experience natural science, technology and mathematics, using all of your senses. You are guaranteed to gain new knowledge about the human body, water, light and the universe. Challenge yourself and your friends, high up in the tree tops. Negotiate the adventure course by using the swings, slides and cable ways.